Definition at line 35 of file control-command.hpp. Definition at line 27 of file control-command.cpp. Reimplemented in ndn::nfd::StrategyChoiceUnsetCommand, ndn::nfd::CsEraseCommand, and ndn::nfd::FaceDestroyCommand. Definition at line 36 of file control-command.cpp. Referenced by getRequestName(), ndn::nfd::FaceDestroyCommand::validateRequest(), ndn::nfd::CsEraseCommand::validateRequest(), and ndn::nfd::StrategyChoiceUnsetCommand::validateRequest(). 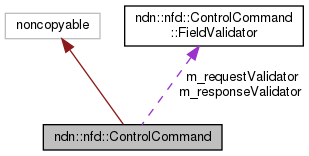 Reimplemented in ndn::nfd::RibUnregisterCommand, ndn::nfd::RibRegisterCommand, ndn::nfd::FibRemoveNextHopCommand, ndn::nfd::FibAddNextHopCommand, ndn::nfd::FaceUpdateCommand, and ndn::nfd::FaceCreateCommand. Definition at line 42 of file control-command.cpp. 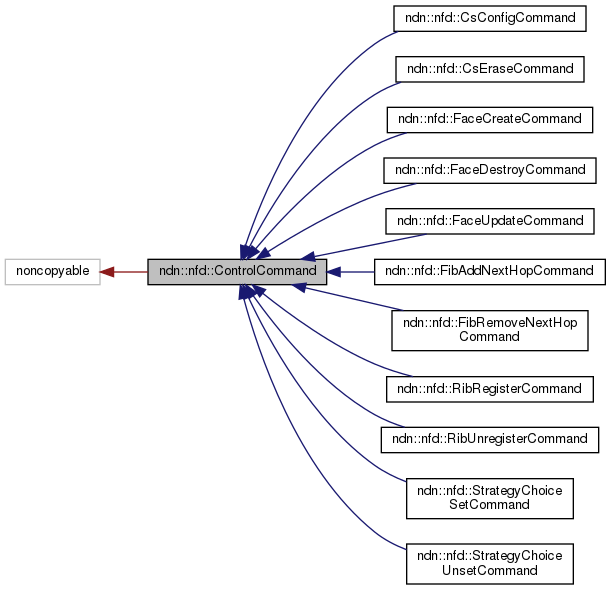 Reimplemented in ndn::nfd::RibUnregisterCommand, ndn::nfd::RibRegisterCommand, ndn::nfd::StrategyChoiceUnsetCommand, ndn::nfd::CsEraseCommand, ndn::nfd::FibRemoveNextHopCommand, ndn::nfd::FibAddNextHopCommand, ndn::nfd::FaceDestroyCommand, ndn::nfd::FaceUpdateCommand, and ndn::nfd::FaceCreateCommand. Definition at line 47 of file control-command.cpp. Referenced by ndn::nfd::FaceCreateCommand::validateResponse(), ndn::nfd::FaceUpdateCommand::validateResponse(), ndn::nfd::FibAddNextHopCommand::validateResponse(), ndn::nfd::FibRemoveNextHopCommand::validateResponse(), ndn::nfd::CsEraseCommand::validateResponse(), ndn::nfd::RibRegisterCommand::validateResponse(), and ndn::nfd::RibUnregisterCommand::validateResponse(). Definition at line 53 of file control-command.cpp. Definition at line 58 of file control-command.cpp. Constructor of subclass should populate this validator. Definition at line 124 of file control-command.hpp. Referenced by ndn::nfd::CsConfigCommand::CsConfigCommand(), ndn::nfd::CsEraseCommand::CsEraseCommand(), ndn::nfd::FaceCreateCommand::FaceCreateCommand(), ndn::nfd::FaceDestroyCommand::FaceDestroyCommand(), ndn::nfd::FaceUpdateCommand::FaceUpdateCommand(), ndn::nfd::FibAddNextHopCommand::FibAddNextHopCommand(), ndn::nfd::FibRemoveNextHopCommand::FibRemoveNextHopCommand(), ndn::nfd::RibRegisterCommand::RibRegisterCommand(), ndn::nfd::RibUnregisterCommand::RibUnregisterCommand(), ndn::nfd::StrategyChoiceSetCommand::StrategyChoiceSetCommand(), ndn::nfd::StrategyChoiceUnsetCommand::StrategyChoiceUnsetCommand(), and validateRequest(). Definition at line 129 of file control-command.hpp. Referenced by ndn::nfd::CsConfigCommand::CsConfigCommand(), ndn::nfd::CsEraseCommand::CsEraseCommand(), ndn::nfd::FaceCreateCommand::FaceCreateCommand(), ndn::nfd::FaceDestroyCommand::FaceDestroyCommand(), ndn::nfd::FaceUpdateCommand::FaceUpdateCommand(), ndn::nfd::FibAddNextHopCommand::FibAddNextHopCommand(), ndn::nfd::FibRemoveNextHopCommand::FibRemoveNextHopCommand(), ndn::nfd::RibRegisterCommand::RibRegisterCommand(), ndn::nfd::RibUnregisterCommand::RibUnregisterCommand(), ndn::nfd::StrategyChoiceSetCommand::StrategyChoiceSetCommand(), ndn::nfd::StrategyChoiceUnsetCommand::StrategyChoiceUnsetCommand(), and validateResponse().